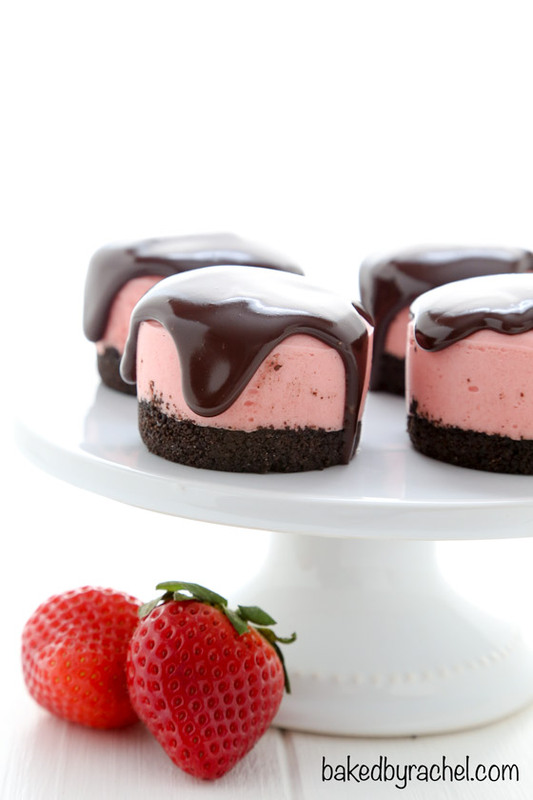 Easy no-bake mini strawberry cheesecakes, topped off with a rich chocolate ganache. A fun two bite dessert! Lately the kids have repeatedly asked a few questions, two very specific questions. Do we have school (insert the day)? Because it’s beyond absurd now how much snow is here, or almost anywhere in New England. And, When is Valentine’s Day? To which I accidentally respond with: Friday. But to be fair, my brain goes straight to why they really want to know when it is and that’s because they want to know when the parties are at school. So, it’s obviously Friday, even though it’s technically Saturday. Makes total sense, right? Next to art, gym and of course, pizza Fridays… class parties are what kids look forward to the most. Oh to be a kid again. The excitement and joy over something so simple. Speaking of simple… how about some (almost) no-bake cheesecakes? I know many shy away from cheesecakes because they can be so finicky. Baking them can be intimidating. Will they fall? Will they crack? No worries with a no-bake version! Whip, fold, fill and chill! Easy as pie…no, easier, much easier than pie. The perfect two bite worry free dessert! 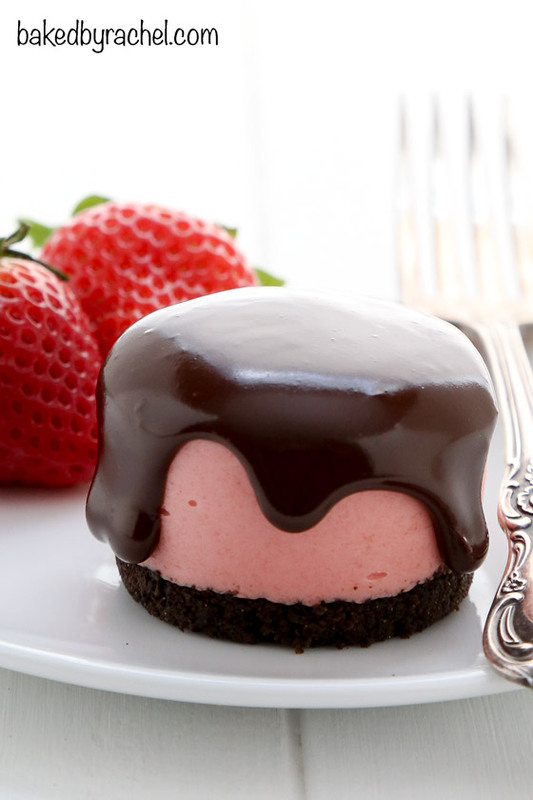 Mini strawberry cheesecakes, topped off with a rich chocolate ganache. A fun dessert for a variety of occasions, including Valentine’s day! Are you enjoying a Valentine’s Day Dinner at home this year? Check out some of my fellow food bloggers ideas for the perfect date night in! Preheat oven to 350°F. Grease a 12 cavity mini cheesecake pan with baking spray. In a small food processor, blend cookies into fine crumbs. Process with butter until combined. Divide between prepared cheesecake cavities, adding 1 small cookie scoop each. Press down firmly into an even layer. Bake for 5 minutes. 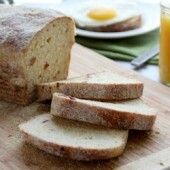 Set aside and allow crust to cool. Dissolve gelatin in water, let sit for 5 minutes. Microwave jam for 30-45 seconds or until warm. Whisk until smooth. Whisk in gelatin mixture until dissolved and broken down. Cool to room temperature. Meanwhile, in a large bowl or stand mixer, beat cream cheese until smooth. Mix in sugar, vanilla and salt until smooth. Add jam mixture and 1 drop of red food coloring, mixing until combined. In a separate large bowl, beat 1/2 cup heavy cream to stiff peaks. Fold whipped cream into cream cheese mixture until no streaks remain. Transfer batter to a large piping bag or plastic bag with the end snipped off. Fill cheesecake pan cavities roughly 2/3 full. 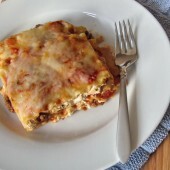 Transfer pan to refrigerator to chill for 6-12 hours or overnight. When cheesecakes are set, carefully remove from pan. Remove cheesecake pan bottom from each crust. Meanwhile, heat 1/2 cup heavy cream in a small saucepan until steaming. Remove from heat, gently stir in 4 ounces chopped chocolate until smooth. Allow ganache to sit for 10-15 minutes or until nearly room temperature. Place cheesecakes on a wire rack over a baking sheet. Slowly pour ganache over cheesecakes. Transfer to refrigerator to set for several hours. These are so pretty Rachel! What a perfect Valentines day treat! These look PERFECT & your kids sound adorable!! Hi Rachel! Although I don’t have individual cheesecake pans do you think these would work if I used individual silicone cups? I have these cute heart shaped ones! Thanks so much! I hope when I am a mom and I do the kid’s translation just like that. Ohhhh to be a kid again – and to have a whole plate of these for Valentine’s Day!! So precious! No bake cheesecake is the best and these mini ones are perfect for valentines day! I want iIt to be V-Day today so that I have a solid excuse to devour these! 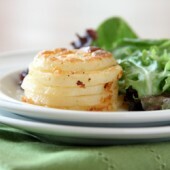 This recipe is totally mouthwatering and your pics are gorgeous too!! Thanks Kate! And yes… it’s ridiculous here! Just found a solution to not owning a mini cheesecake pan: use mason jar lids! Saw it on morning tv. Can’t wait to try it! I wouldn’t recommend doing that as not only the ingredient amounts won’t work for that size container, but the ridges within jar lids won’t allow for easy removal. If you’re looking for an easy solution, that will work, I’d recommend using cupcake/muffin liners within a muffin tin instead. These are gorgeous! 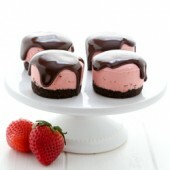 Strawberry and chocolate is one of my fave combos ever – I would totally devour about 10 of these in 30 seconds!! I looove this!! They’re beautiful!! 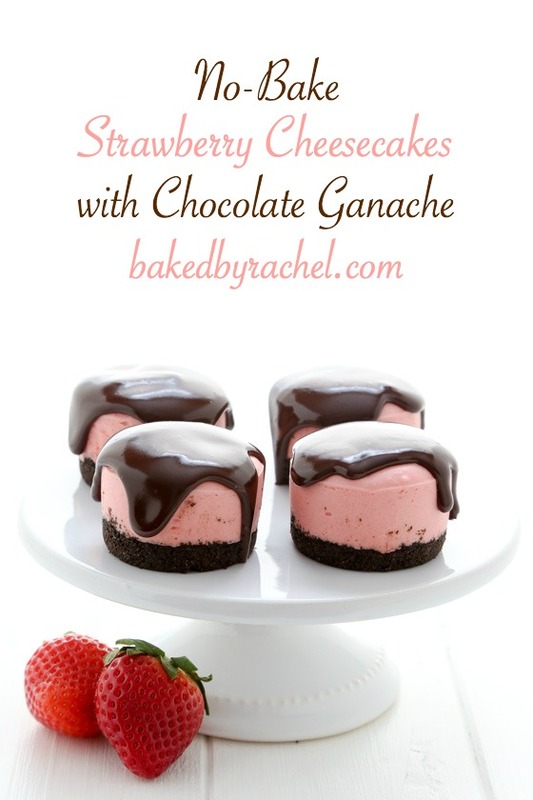 This is the perfect Valentine’s day dessert and the ganache just makes it 1000x better! These are gorgeous! I just made your red velvet recipe yesterday and they were amazing! These look absolutely gorgeous Rachel!! Hope you’re staying warm! I have to get one of these mini cheesecake pans. I love cheesecake, but I’ve stopped baking them at home because a whole cheesecake is too much for just me and my husband. Well, not really too much but too much for me and fitting into my jeans! I have no portion control when it comes to cheesecake. I see that you have a couple different varieties in your archives. I look forward to getting the pan and trying them out. These mini ones are a great idea! You make the prettiest mini cheesecakes, Rachel! These are gorgeous! Pinned! There are free online translators that can translate an entire webpage for you. adorei essa receita… mas nao posso entender…. These little cheesecakes look SO beautiful and delicious too. All that chocoalte ganache is making me drool too! How beautiful , I do !! 2 questions: you strip out the filling of oreo cookie? and the ganache in the fridge does not tarnish and is hard , would not put the ganache just before serving ? Thank you and congratulations !! No, the filling is included and is considered the sweetener and part of the binder for the crust. For a liquidy glaze like ganache, you can add prior to serving. Chilling the ganache will not make it hard, it does firm up in comparison to it’s prior liquid state, but is still soft and easy to eat and slice through. can these be frozen. They suit the theme for a wedding I am doing. I absolutely loved the recipe. The cheesecakes turned out gorgeous and scrumptious. Do you have any recommendations on how to transport them? So glad you enjoyed the recipe! As for transporting them, if you have a mini cupcake carrier, that would work great. Otherwise, you could put paper towels or some cloth down in a container to prevent them from sliding around until you get to your destination. Hi! Do these have to set in the fridge? Or can they set in the feezer? If so, how long should they stay in the freezer? I haven’t set them in the freezer before so if you were to try that, it would be at your own risk. Good luck! These look tastey and I can’t wait to try them. I was wondering though if you could use Cool Whip instead of regular whipped cream since Cool Whip has a stabilizer already in it? Your thoughts. Thanks Rachel. I would not recommend using cool whip for this recipe. The cheesecakes look gorgeous, tasty, and oh so cute! I was wondering about the success using a mini muffin tin with liners and also wondering about freezing some of the cheesecakes. Im glad the comments answered these questions. I think this will be the recipe my daughter and her friend will ‘bake’ this week. They bake together once a week. A mini muffin pan has smaller cavities than the mini cheesecake pan, so you’ll need to fill appropriately and not following the exact recommendations in the recipe. As far as freezing goes, I can’t be sure how well that will work with these but it’s always worth a try. Good luck!